Family parenting instills important principles and values in your children for life, building strength and character along the way. These principles will carry them from the time they are born until the time they reach their last breath. Unfortunately we are not handed an instruction book when our children come into the world but the Word of God is true and holds the key for all of life's issues and concerns, including that of raising our precious children. You may have many frustrating moments when teaching and training your children to perform various activities, or behave in certain ways; however, children do learn by example and so you will want to make sure that you are modeling correct behavior towards your children, your spouse, and others around you. Believe it or not, you are their first and best teacher. You are the first person in which your children will learn all the necessary things of life. In many ways children are like an extension of ourselves and at times we tend to live vicariously through them, even if we don't wish to do so. 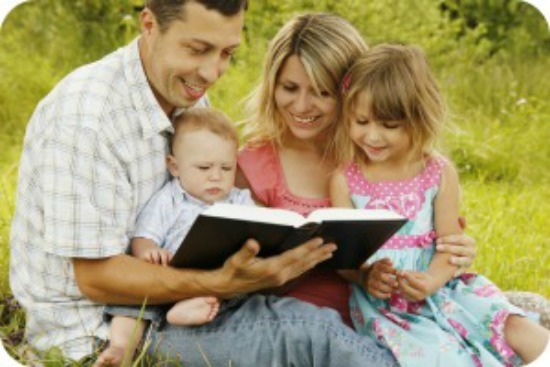 Demonstrate, by example, the Word of God within your household. When you, as a believing parent, live your life in a godly way on a daily basis, you are teaching your children the importance of holy living at home, school, and at play. Teach them through praying, studying the Bible, worshiping at home and church, and how to treat others within their environment. Be available for listening to your child/children. They may be small creatures but they want and need to be respected and listened to. They need to feel validated in their own feelings and emotions as well. Always know where your children are and whom they are with. This is so important in that our world is full of those who would do harm to our precious ones. As a parent it is pertinent that you are present in their everyday lives, knowing about all their "ins and outs." Teach your children to give to others. This is an important skill to learn within family parenting in that there is so much temptation out in the world to accumulate things for ourselves, instead of giving away to those who are in need. They will learn the true reward is in giving and not taking, and they will see outside of themselves, instead of only wanting what they want. I also taught this skill to my daughter when she was quite young and she remains to be a very giving person to this day. Spend quality time with your kids. Generally children are so happy when mommy and daddy are around and love the time of togetherness. It helps in the development of their identities and brings about a strong bond of love between parent and child. Discipline your children. Please do not do this in anger, but always in love, according to God's Word. I have found that children learn through the firmness of certain rules placed in the home, and yet they need to know that rules are placed there because of safety and love they have for the children. Many lessons I have learned through this skill with my own child. You can also demonstrate discipline by being disciplined yourself. Your child's future character will become fashioned through the various forms of discipline within his/her own life. Include the grandparents in your children's lives. Grandparents know a thing or two when it comes to parenting. After all, they parented you (unless you were parented by others). They are a great source of inspiration, wisdom, knowledge, patience, and understanding in the lives of your children. When you read and study God's Word as you parent your children from day to day, you will find all the solutions you will ever need for raising your precious ones in the Lord. I can tell you that there have been times of hardships and frustrations along the way for me in the raising of my daughter, but as I relied on scripture for guidance, God has given me so much strength, grace, and hope to push through on to another day, another month, and yet another year. And He will do the same for you while you put your trust in Him as you parent your children too. Proverbs 22:6 says to, "Train up a child in the way he should go: and when he is old, he will not depart from it." Deuteronomy 6:6-9 tells us, "And these words, which I command thee this day, shall be in thine heart: And thou shalt teach them diligently unto thy children, and shalt talk of them when thou sittest in thine house, and when thou walkest by the way, and when thou liest down, and when thou risest up. And thou shalt bind them for a sign upon thine hand, and they shall be as frontlets between thine eyes. And thou shalt write them upon the posts of thy house, and on thy gates." Hebrews 12:7-11 says, "If ye endure chastening, God dealeth with you as with sons; for what son is he whom the father chasteneth not? But if ye be without chastisement, whereof all are partakers, then are ye bastards, and not sons. Furthermore we have had fathers of our flesh which corrected us: and we gave them reverence; shall we not much rather be in subjection unto the Father of spirits, and live? For they verily for a few days chastened us after their own pleasure; but He for our profit, that we might be partakers of His holiness. Now no chastening for the present seemeth to be joyous, but grievous: nevertheless afterward it yeildeth the peaceable fruit of righteousness unto them which are exercised thereby." Proverbs 13:24 says also, "He that spareth his rod hateth his son: but he that loveth him chasteneth him betimes." Proverbs 29:15-17 tells us, "The rod and reproof give wisdom: but a child left to himself bringeth his mother to shame. When the wicked are multiplied, transgression increaseth: but the righteous shall see their fall. Correct thy son, and he shall give thee rest; yea, he shall give delight unto thy soul." Ephesians 6:1-4 says, "Children, obey your parents in the Lord, for this is right. Honor thy father and mother; which is the first commandment with promise; That it may be well with thee, and thou mayest live long on the earth. And, ye fathers, provoke not your children to wrath: but bring them up in the nurture and admonition of the Lord." Psalm 127:3 reminds us, "Lo, children are an heritage of the Lord: and the fruit of the womb is His reward." Titus 2:6-8 instructs, "Young men likewise exhort to be sober-minded. In all things showing thyself a pattern of good works: In doctrine shewing uncorruptness, gravity, sincerity; Sound speech that cannot be condemned; that he that is of the contrary part may be ashamed, having no evil thing to say of you." Isaiah 65:23 says, "They shall not labor in vain, nor bring forth for trouble; for they are the seed of the blessed of the Lord, and their offspring with them." As you can see clearly, God requires much from His people, in that we are to remain faithful to Him in everything, including raising up those who are precious to us within our own family. Consider the use and application of various Christian homemaking skills and talents when creating a nurturing family environment for all who live with you. As the challenges of family parenting increase day by day, year by year, God's Word never changes. When you trust that His ways are better as your ways, as you parent your child/children, you can be assured of the joy and peace that comes in knowing you have had a huge part in bringing up future souls for God's purpose and for His kingdom.